ESSENCO (initially Nallaseth, Nair & Co) was founded in 1986 when companies involved in plumbing contracts in South India were mostly small family-run businesses. Extensive international experience possessed by members of the senior management enabled the establishment of a well-structured organisation with a fresh approach to the profession. At a time when Plumbing was a neglected profession wherein no education/training programmes existed, ESSENCO pioneered in conducting in-house training for engineers and supervisors. 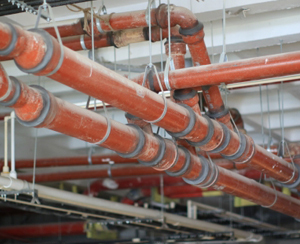 This resulted in the creation of a team of talented, technically sound plumbing professionals. Many of these individuals have established their own consulting and contracting firms over the past 32 years. plumbing industry. 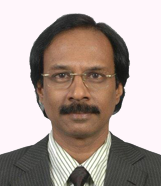 Mr. Sudhakaran Nair is one of the Founder Members of IPA and was its National President between 2006-’16. 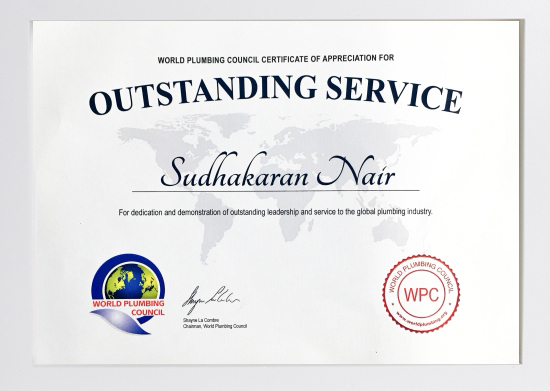 Mr. Nair was elected to the Executive Board of the World Plumbing Council (WPC) – the global body representing plumbing organisations – in 2005 as Director and retired from the body in 2016 as Chairman after serving the Council for nearly 12 years – a first for an Asian. ESSENCO has maintained an in-house design department right from its inception and was probably the first Plumbing Contractor in India to offer detailed Working Drawings as part of its services. What was seen as an exception in the eighties has now become the norm in the industry. The core principle of the company, to approach Plumbing as a passion, rather than a business, has been inculcated in all its employees. This has been a key value differentiator for our discerning Clients and probably our main success factor. ESSENCO, an ISO 9001:2008 company, is proud of over 375 large projects it has been involved in during its operations over the last 32 years. The list has several repeat customers and includes over 60 hotel projects, 45 software facilities, 80 residential and commercial projects, 8 hospitals, 9 institutional projects and 3 stadiums. Total volume of Plumbing & Fire Protection installations successfully completed so far is in excess of Rs.4750 million. Value of the largest single contract awarded to us is Rs.320 million. The ESSENCO team now includes nearly 80 staff members and over 300 skilled technicians based at Bengaluru (corporate office), Hyderabad, Chennai and Goa. The senior management who are recognised veterans in the profession, are actively involved in the operations. Additionally, a team of young Managers have been trained over the years to lead the company in future. 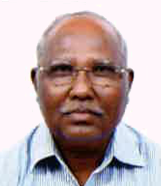 Mr. Nair began his career in the plumbing profession in 1970. After successful completion of several prestigious projects in India, took charge of operations of International Sanitation Co (Oman) L.L.C. in 1976. During a stint of 13 years in the Middle East, had exposure to International Standards and Practices in the trade, travelled extensively and associated with leading international architects, consultants and contractors on over 250 projects. Eventually became Group General Manager of three firms handling all aspects of MEP services. Returned to India in 1986 and established own business in association with Mr. Nariman Nallaseth (who subsequently retired in 1991), Mr Manohar Barot, Mr Vinod Sitapara and Mr Ajit Nair. 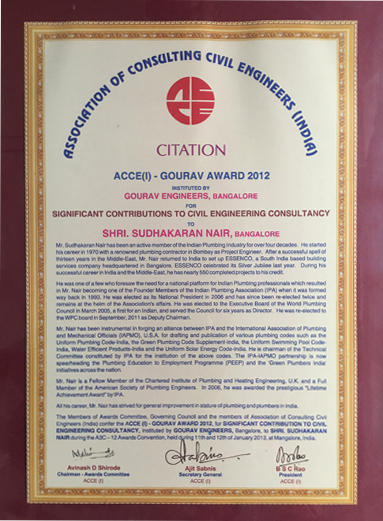 The Company has gone from strength to strength since then and is now acknowledged to be one of the best in India. Director/Chairman, World Plumbing Council (2005-2016). Full Member, American Society of Plumbing Engineers. 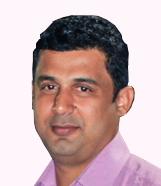 Mr. Nalwala realigned with his old colleagues at ESSENCO in 2002 and is today the international face of the organisation. 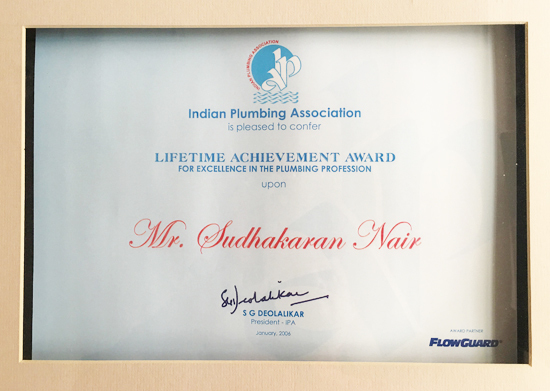 He is also a Founder member of the Indian Plumbing Association. 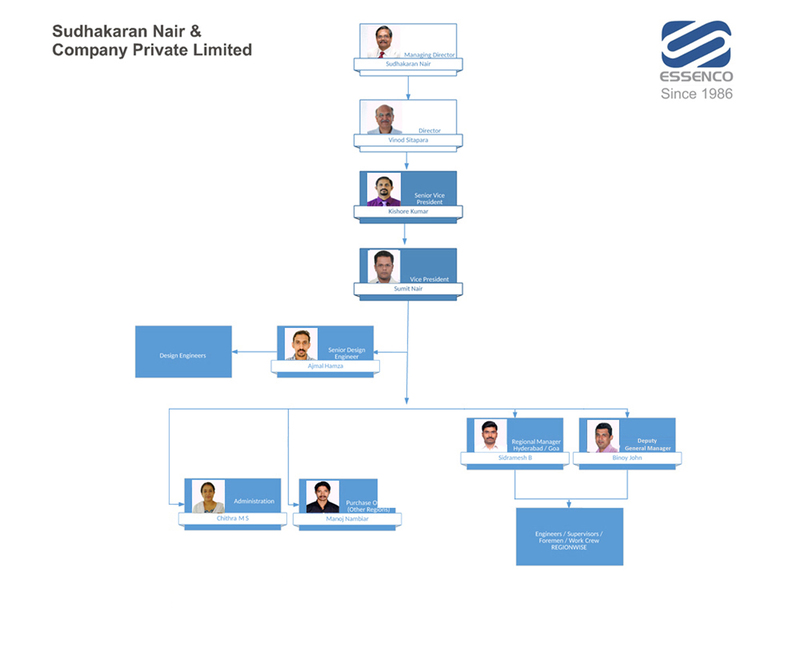 A veteran of over 46 years in the Industry, his career paralleled Mr. Sudhakaran Nair’s till he left International Sanitation Co (Oman) LLC to join the Al Ansari Group of Companies in 1983 and is currently Managing Director of the group. The Al Ansari Group today is one of the largest and most reputed organisations in the Middle East, with several diversified business interests including Manufacturing, Trading and Contracting. 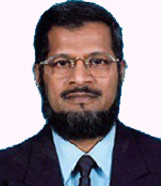 Started his career with M/s Nariman Nallaseth & Company in Mumbai in 1972. 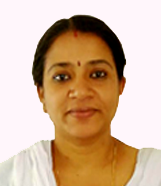 Has had vast exposure to all aspects of the trade for over four decades in India and abroad. He is respected in the Industry & by the ESSENCO team for his exceptional personnel management skills and vast experience. 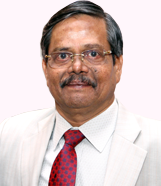 Mr. Vinod Sitapara has been a Director of Sudhakaran Nair & Co Pvt Ltd (ESSENCO) since inception of the company in 1986. 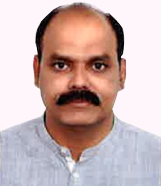 He joined the plumbing profession in 1976 and worked abroad for the next ten years in International Sanitation Co (Oman) L.L.C in various senior positions. During his involvement of over four decades in the plumbing industry, he has mastered all aspects of the profession including design, estimation and execution of projects of any magnitude and sophistication. He is fully conversant with modern plumbing codes and standards and implements them in the design process the company undertakes. He has played a key role in the success of ESSENCO over four decades and is respected in the industry for his deep knowledge, skills and integrity. 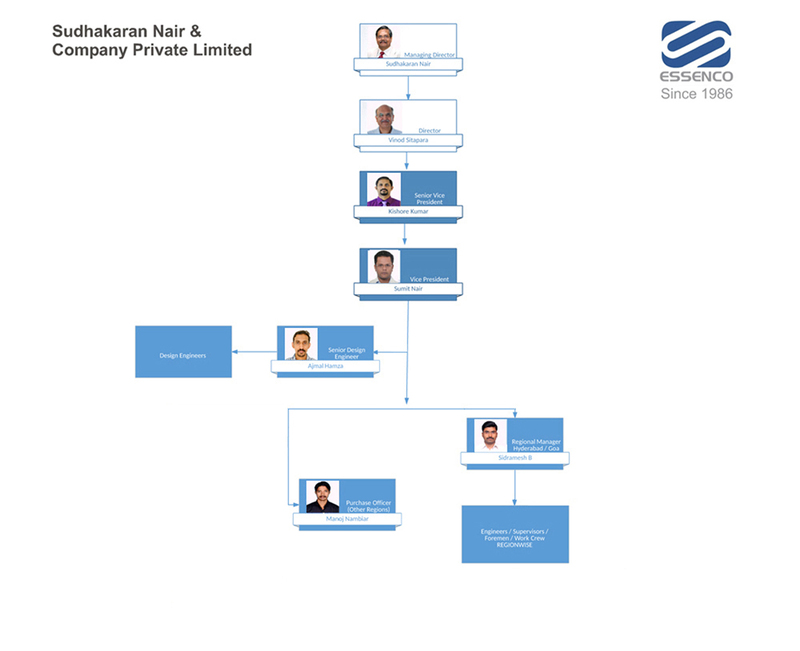 After a five year stint abroad, returned to India in 1986 and joined Mr Nallaseth, Mr. Sudhakaran Nair, Mr. Barot and Mr. Sitapara to establish what was then known as Nallaseth Nair and Company. He is an 'organiser' of extraordinary ability and an active member of several welfare organizations. Trained as a Plumbing Engineer in ESSENCO since 1999, after graduation in Civil Engineering. 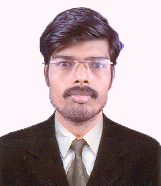 Has been trained in all aspects of the profession including design, estimation and project execution. 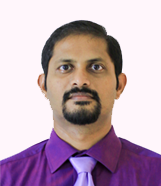 He is now based at the Corporate office to oversee the operations of the Company. A Graduate from Thames Valley University, UK joined ESSENCO in 2007. 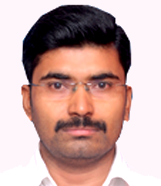 Accomplished in handling estimation and tendering from our Corporate office in Bangalore, has now assumed overall charge of Project execution in the Bangalore region and handles general administration including personnel management. A graduate in engineering, has shown keen aptitude for design of complicated plumbing and fire fighting systems. In a relatively short period of five years, has become the key member of the design team. 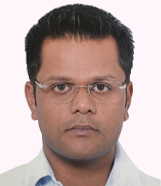 Joined ESSENCO in 1999 and has risen up in the ranks by spending nearly two decades in several different kinds of projects and is currently heading operations in Tamil Nadu. Has also been involved in the Company’s overseas operations in Mauritius and Bhutan. 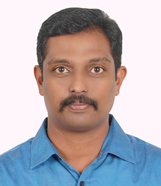 Trained as a Plumbing and Fire protection engineer since 2000; and is presently independently handling the largest project awarded to the Company in Bangalore. Was earlier managing the Company’s projects in the Chennai region. 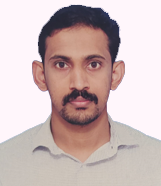 After twelve years with the company, starting as a trainee engineer in Hyderabad, presently handles the Company’s operations in Andhra Pradesh and Goa. 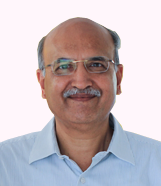 Has been with the Company since 1995 and has climbed up the ladder and has taken charge of finance management of ESSENCO. Based at the Corporate office in Bangalore, has overall responsibility of taxation and other statutory compliances, as well. Joined the company in 1997. 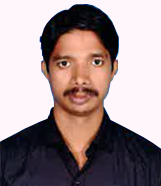 Has been responsible for administration and finance of the company in Kerala region, until shifting to HO recently. 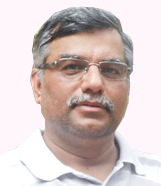 Joined ESSENCO in 2000 and is responsible for finance management of the company on out-station projects. Part of the ESSENCO team since 2006 and is presently based in HO.